Let's start with what its impact will not be. It will not bring American opinion together; if the "United We Stand" slogan lasted brief months after 9/11, consensus after Boston will be even more elusive. The violence will not lead to Israeli-like security measures in the United States. Nor will it lead to a greater preparedness to handle deadly sudden jihad syndrome violence. It will not end the dispute over the motives behind indiscriminate Muslim violence against non-Muslims. And it certainly will not help resolve current debates over immigration or guns. Education by murder is the name I gave this process in 2002; we who live in democracies learn best about Islamism when blood flows in the streets. Muslims began with an enormous stock of good will because the Western DNA includes sympathy for foreigners, minorities, the poor, and people of color. Islamists then dissipate this good will by engaging in atrocities or displaying supremacist attitudes. High profile terrorism in the West - 9/11, Bali, Madrid, Beslan, London – moves opinion more than anything else. I know because I went through this process first hand. Sitting in a restaurant in Switzerland in 1990, Bat Ye'or sketched out for me her fears concerning Islamist ambitions in Europe but I thought she was alarmist. Steven Emerson called me in 1994 to tell me about the Council on American-Islamic Relations but I initially gave CAIR the benefit of the doubt. Like others, I needed time to wake to the full extent of the Islamist threat in the West. Westerners are indeed waking up to this threat. One can get a vivid sense of trends by looking at developments in Europe, which on the topics of immigration, Islam, Muslims, Islamism, and Shari'a (Islamic law) is ahead of North America and Australia by about twenty years. One sign of change is the growth of political parties focused on these issues, including the U.K. Independence Party, the National Front in France, the People's Party in Switzerland, Geert Wilder's Party for Freedom in the Netherlands, the Progress Party in Norway, and the Swedish Democrats. In a much-noted recent by-election, UKIP came in second, increasing its share of the vote from 4 percent to 28 percent, thereby creating a crisis in the Conservative party. 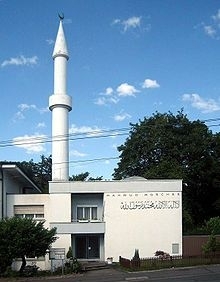 The Zurich mosque and minaret. These commanding majorities are higher than in earlier years, suggesting that opinion in Europe is hardening and will grow yet more hostile to Islamism over time. In this way, Islamist aggression assures that anti-Islamism in the West is winning its race with Islamism. High-profile Muslim attacks like the ones in Boston exacerbate this trend. That is its strategic significance. That explains my cautious optimism about repulsing the Islamist threat. Apr. 27, 2013 update: Herbert Eiteneier translates me into German and often catches mistakes or adds interesting commentary to my writings. Today he points out that "People won't harden their views on Islamism but on Islam." He's right – and that is the gist of the many indicators in my piece above. Those political parties and polling results from Europe are not about Islamism but Islam. The reason I overlooked this is my expectation that, with time, Europeans and others will grow more sophisticated. But for now, yes, the hostility is to Islam itself. Apr. 29, 2013 update: Ha'aretz, "the Palestinian newspaper printed in Hebrew" (in the felicitous phrase of Steven Plaut) has served up the weirdest response to this article. In a commentary by one Bradley Burston, the paper castigates Mark Steyn and me for rejecting "any association between Islamist terrorism and U.S. – and for that matter, Israeli – military operations" in the case of the Boston marathon attack. Comment: Leave it the sicko Israeli left to label the Jewish state as the root cause when no one else so much as mentioned it.